A few months ago I decided to write a little on the ‘Fruits of the Spirit’ as part of my journey as a Christian woman. I am always amazed at how the words of Jesus have spoken directly to my heart and helped me when I needed it. I also am a believer that the the bible is “LIVING” and when we come to the word of God and pray that the words do shed a light and help us. So before I leave on my trip to India I want to see if I can’t finish this exploration. If you Google “kindness quotes” you will be overcome by how many there are! Theologians, leaders from every world religion, actors, writers, inventors, scholars, lawyers, and so many more share thoughts on kindness! You would think then if so many “important” people are writing on the virtues of kindness that our world would indeed be a kind place. 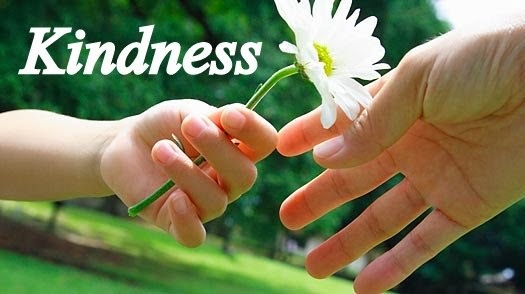 When you walk out the door do you experience kindness more often than rudeness? Interesting thought. I will bet you a nickel that you will remember the person who showed you a kindness. That person made you feel good for a moment in your day and it changed you just a little for some length of time. It is a feeling that I hope would lead you to offer to another! But our world is also full of people who cut in line, insult those around them, don’t open doors for old ladies and people with groceries, laugh at others’ misfortunes and try to show their superiority by dragging others down. These people I believe equate kindness with weakness or think small acts of kindness are frivolous and unimportant. Yet there are also many people who let others go ahead of them in line, compliment those around them, hurry to open doors for people, sympathize with others’ misfortune and show their humility and willingness to serve others. It’s easy to pick out the people who are showing kindness! Unfortunately, people who base their thinking on a “survival of the fittest” mentality may not see the rationale for true kindness. People like to receive it, but often don’t really see the benefit of being kind. Proverbs 20:28 describes qualities God wants in a leader: “Mercy and truth preserve the king, and by lovingkindness he upholds his throne” (emphasis added throughout). Throughout the Bible, two other qualities are often associated with kindness: love and mercy. Peter wrote of adding love to “brotherly kindness” (2 Peter 1:7), while Paul wrote about putting on “tender mercies, kindness, humility, meekness, longsuffering” (Colossians 3:13). I believe that kindness is humbly giving of ourselves in love and mercy to others who may not be able to give anything back, who sometimes don’t deserve it, and who frequently don’t thank us for it. Basically kindness means a way of thinking that leads to doing thoughtful deeds for others. Does the kindness I show to others reflect God’s kindness to me? Examples? Do I seek to gain from the kindness I show, or is it pure kindness? How do I know? Do my kind acts have the components of mercy, love and compassion? How so? When I am truly able, how much do I sacrifice for others instead of showing selfishness? Maybe today or this week you can practice some random acts of kindness along with me. I like the questions above too and I will spend some time answering them as well. Interact with strangers instead of just walking by them or looking down at the ground (open doors for them, smile, say hello, help them carry something). Make room for kindness in your personality and daily schedules. Please share with me an act of kindness you were shown or you gave! I would truly love to hear about it. This entry was posted in Faith, Inspiration, Motivation, Nourishment, Uncategorized and tagged bible, christian living, fruit of the spirit, kindness. Bookmark the permalink. Just moments ago I received the most beautiful letter of thanks….totally unexpected, and pleasantly surprised.